The diversity of posts for Paris in July is quite outstanding- so many different approaches, and so many aspects of Paris to highlight. I'm devoting more and more time to it- I'm sure we all are! Posts about two memoirs, toys and the tour from me this week. I'm loving reading everyone's posts, and thank you for the 'highly recommended' for the pet cemetery post. I've got really behind this month and only just started my Paris in July reading, if only life wouldn't get in the way! Thanks for keeping track all of the interesting posts on France. I'm lovin it - oh, that's McDonalds, not France! Thank you so much for mentioning my post and recommending it to your readers! The Bea's Knees is a very new blog and your encouragement and support was really very valuable. Loved your other recommendations too, you made it much easier for me to prioritise my Paris in July readings.Following you now! If you liked The Bea's Knees, do visit again and follow! Thank you! Hi Marg, Yes, please leave links to you new posts here. Karen and I will make sure we double check both blogs for new postings.. Thanks for the special mention of my movie review. This week, I'm searching for Van Gogh in France. Van Gogh was a Dutch painter who thrived when he moved to Arles in Southern France. I've reposted an excerpt of my travelogue, with photos of Arles paired up with Van Gogh's paintings. Ari, thanks for that. I was in Arles last year and you've reminded me I could post some of those photo's too.. Its a small world. I am loving reading everyone's posts! Weekend Cooking - <a href="http://anglersrest.blogspot.co.uk/2012/07/weekend-cooking-little-paris-kitchen-by_14. 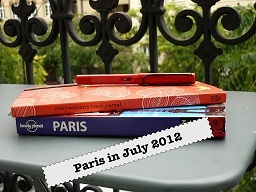 Since this is my first year doing Paris in July, I'm not sure where I'm supposed to post the links to my blog entries. I left comments on BookBath for two of them. Today I wrote another and will leave the link here. Thanks to your recommendations, I just discovered "inkyfoot" blog. WOW what great pictures for the Paris in July Challenge. Thanks. Today I have shared a recipe for Poulet Cocotte Grandmere! Thanks for putting my post on the list. The book I reviewed was The Paris Enigma (Death of a Detective...) but my blog's name is 'a hot cup of PLEASURE' and not 'a hot cup of SOMETHING' as you have stated which frankly sounds downright dismissive. Congratulations to Team Sky, Bradley Wiggins and Chris Froome. The British are happy today and to be able to go to Paris for the weekend. A beautiful Stage 20 in Paris. OOPS. Congratulations to the French riders -Thomas Voeckler from Alsace-Lorraine region-king of the mountains and the stage winners from France. What a fun Paris in July challenge and Tour de France. Now I can get back to my life (a daughter's wedding) until next year. I finally got my first post up! Thanks for sharing all of these posts. I'll have to go check them out. Just put up a poem by Rimbaud! Wow! Thank you all for leavng the links to your recent posts here. I'm really enjoying them all. I'll be posting this weeks review on the 30th. Keep them coming. Paris in July - Random Prize!